You will need MongoDB 3.6+ and Node.js 6+ installed on your machine. You should have some knowledge of Node and React, and a basic understanding of MongoDB management tasks. Getting data changes from a database in realtime is not as easy as you may think. Poll the database every X seconds and determine if something has changed using a timestamp, version number or status field. Use database or application-level triggers to execute a piece of code when something changes. Use the database transaction/replication log, which records every change to the database. However, in MongoDB, change streams allows you to listen for changes in collections without any complexity. Change streams are available since MongoDB 3.6 and they work by reading the oplog, a capped collection where all the changes to the data are written and functions as the database replication log. In this tutorial, you’re going to learn how to stream, in realtime, the changes made to a collection in a MongoDB database to a React app using a Node.js server. Under the hood, it communicates to an API implemented in Node.js that saves the changes to a database. 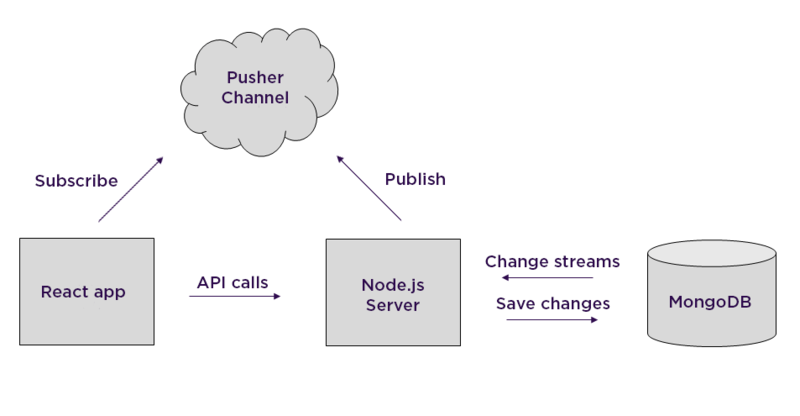 The Node.js script also receives these changes using change streams, parsing them and publishing them to a Pusher channel so the React application can consume them. Of course, a scenario where multiple applications are writing to the same database could be more realistic, but for learning purposes, I’ll use a simple application. In addition, you’ll see how a solution like this one, could be a good alternative to the realtime database capabilities of Firebase. For reference, here is a GitHub repository with all the code shown in this tutorial and instructions to run it. Now let’s start by creating a Pusher application. If you haven’t already, create a free account at Pusher. Save your app id, key, secret and cluster values. We’ll need them later. Since change streams use MongoDB’s operations log, and the oplog is used to support the replication features of this database, you can only use change streams with replica sets or sharded clusters. It’s easier to use replica sets, so let’s go that way. mongod --dbpath <DATA_PATH> --replSet "rs"
Next, in a separate terminal window, run mongo, the MongoDB client. The application is going to watch the collection tasks in a database called tasksDb. Usually, the database and the collection are created by the MongoDB driver when the application performs the first operation upon them, but for change streams, they must exist before opening the stream. 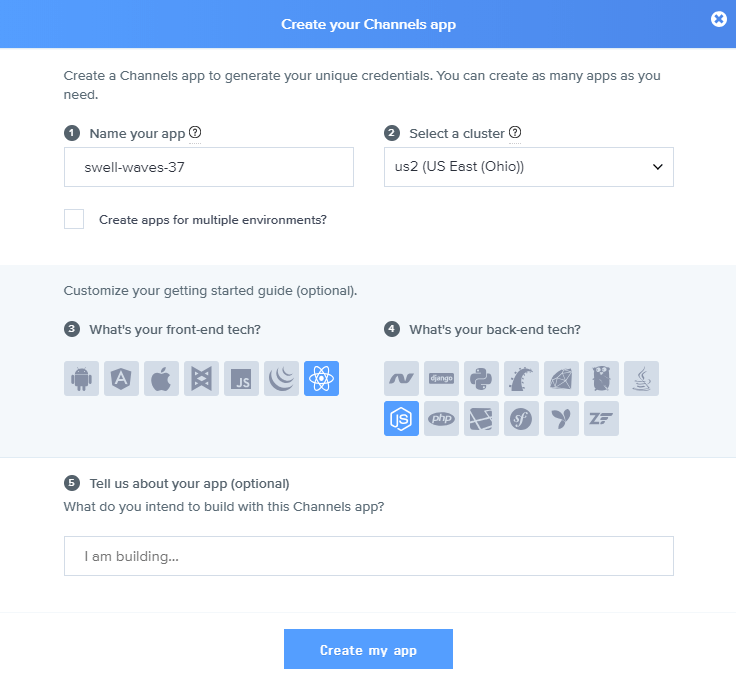 Now you're ready to start building the application. Let’s start with the Node.js server. body-parser is a middleware for parsing the body of the request. 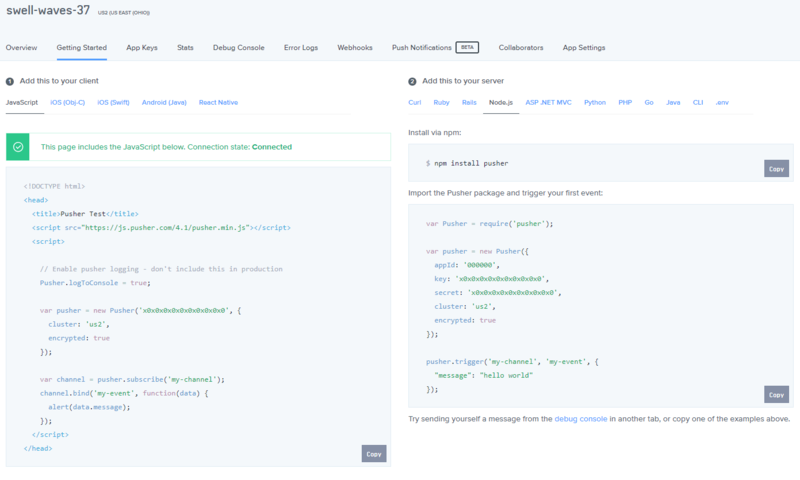 express to create the web server for the REST API that the React app is going to use. mongoose is a schema-based library for working with MongoDB. pusher to publish the database changes in realtime. As you can see, the collection is only going to store the task as text. Here comes the interesting part. You can use the _id property to resume a change stream, in other words, to start receiving events from the operation represented by that property. Notice that in this case, the deleted object is not returned, just its ID in the documentKey property. You can learn more about these change events here. And that’s the code for the server. Now let’s build the React app. Let’s use create-react-app to bootstrap a React app. Let’s review each method. Add them after the constructor, before the render() method. The app will call these methods when the corresponding event from Pusher is received. This way, the render method just renders the tasks from the state using a Task component and a form to enter new tasks. And that’s it. Let’s test the complete application. This is equivalent to the functionality provided by Firebase and its realtime database. The advantage is that a solution like the one presented in this tutorial is more flexible and gives you more control. Implement an update functionality for the tasks (for example, the status) and replicate this event. Use the resume token to receiving the events from the last one registered, after a connection failure. Remember that in this GitHub repository you can find the code of the Node.js server and the React app.